Why Have a Building Energy Audit Performed? There are several reasons having an energy audit done is the right decision for most building owners. In these days of uncertainty, it is important to keep operating expenses to a minimum. One difference between companies that weather these difficult times and those which do not survive, will be that the survivors will have reduced their unnecessary expenditures before it is too late. Unnecessary costs include costs for energy you don’t need to use. In the past, many companies have just considered utilities as “a cost of doing business.” By running an inefficient building, you are overpaying your utility for energy. It just doesn’t make any sense. A good building energy audit will point the way to reduce your energy costs by 10% to 40%. For large organizations, this can be substantial, and could mean the difference between staying afloat and going under. There are so many vendors peddling their energy efficient devices which are supposed to save energy–most of them do, but some don’t. Just because a device saves energy does not mean it is a good investment. And even if it is a good investment, there may be better energy efficiency investments available. For example triple-pane windows that you hear advertised on the radio usually save energy, but for some buildings, they will actually result in an increase in energy usage. It is usually a better investment to replace your incandescent light bulbs with CFLs than it is to change out your windows. So how do you determine what are the best energy conservation measures for your building? That is what an energy audit is for. 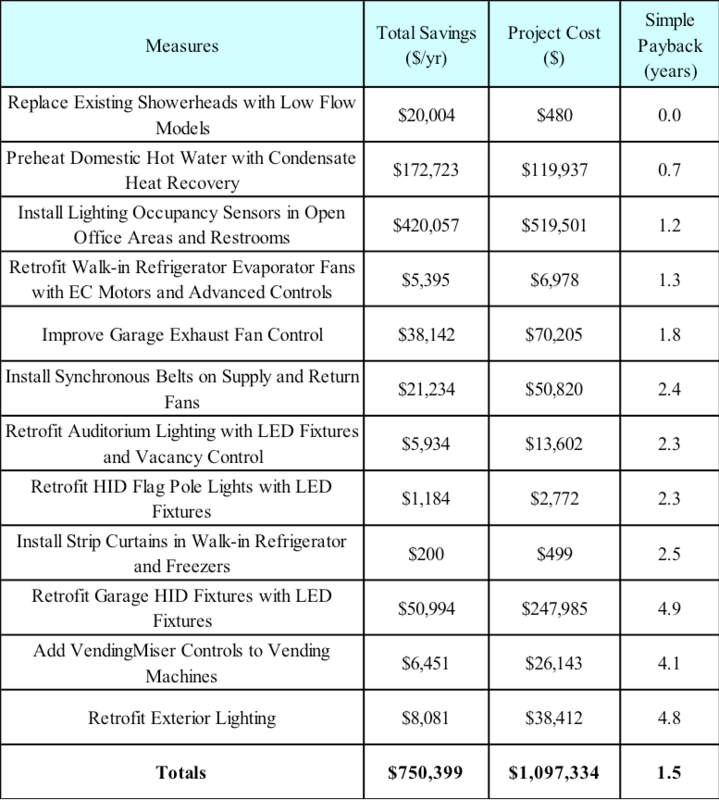 The table below lists energy conservation measures from an audit we recently performed on a large office. 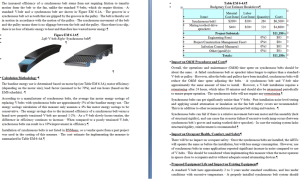 In this format our client is able to easily evaluate and prioritize the different energy efficiency opportunities. We understand the argument that if your tenants are paying the utility bills, then there is no reason to invest money in making your building energy efficient. After all, you won’t be reaping any energy savings. Keep in mind that increasing the energy efficiency of your building will increase in value. If you have a “green” building, your tenants will be happy to pay higher rents to occupy your building. 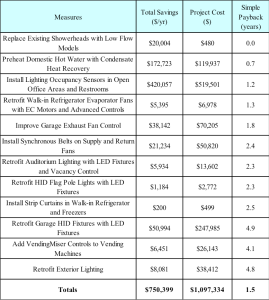 On average for every dollar spent in energy efficiency improvements, appraised building value increases several times. What is a Commercial Energy Audit? An energy audit report is a carefully thought out plan, which, if followed, will lead you to reduced energy costs. Every building is different, and each contains different opportunities which can reduce energy usage. This is why every different building requires its own unique energy audit. During the energy audit, an energy auditor will visit your site and interview your facility manager, inspect your lighting, air conditioning, heating and ventilation equipment, controls, refrigeration, air compressors, water consuming equipment, and anything else that is using energy. Depending on the type of audit, the auditor may take measurements of temperatures, pressures, light levels, power draw, and other things. Some of the ECMs identified in the audit will take decades to pay for themselves, while others will start paying for themselves within months. Once you have the audit in hand, you can make good decisions as to where to invest your energy efficiency money. Energy Balance: A breakout of facility energy usage into end uses. How much money/energy can be saved by getting an energy audit? When talking about possible energy savings in a facility from performing an energy audit, it’s impossible to make a reasonable estimate without understanding how the building operates and uses energy. With that said, we’ve seen savings upwards of 40% on some facilities, with the average savings being around 10-20%. If the facility has already had energy audits in the past, and the identified measures were implemented, it’s possible that the facility is already efficient, and in that case, there might be much less energy savings potential. If the facility has been in operation for many years without having had an energy audit, it’s very possible that an energy audit can save you a significant amount of money. If you want to make an easy estimate, for a building that has not aggressively pursued energy efficiency in the past 10 years, assume 20% savings potential. For a building that has been pursuing energy efficiency in the past 5 years, assume 10% savings potential. These estimates cannot be too far from the truth. Since it’s extremely difficult to assess how much your facility can save without knowing more about your company, we will gladly provide you with a Free Energy Audit Consultation. By having this consultation, we can decide whether or not you need an energy audit at all, and if you do, what kind would best suit you and your facility. Here’s an example of energy wasted. 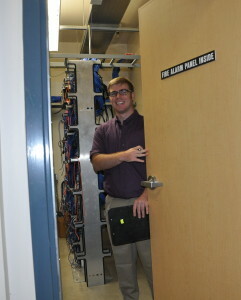 This is an over-lit, air conditioned server room- click on the image at right to see the lack of servers in it. Don’t All Auditors Produce the Same Quality Work? Sadly, no they do not, nor do energy auditors have the same degree of proficiency at their craft. And what is worse is that most commercial energy audit customers may not be able to tell qualified energy auditors from novices. 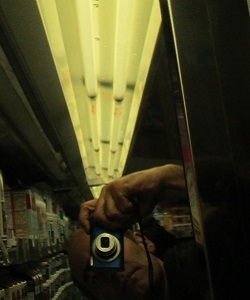 Energy auditing is a profession, like lawyering. Not all lawyers can produce the same results–the same applies to energy auditors. Wasting thousands of dollars in installing the wrong energy conservation measures. Most facilities have a limited budget for energy efficiency. It is best to use that budget on the best energy conservation measures. Poorly done audits often miss these. Wasting thousands of dollars installing energy conservation measures that won’t save money, or that will save much less than the audit would lead you to believe. Wasting thousands of dollars in wasted energy from not knowing about no-cost/low-cost measures that could have saved you money. These measures often are related to HVAC control, and inexperienced auditors often miss these. There are more ways a poorly done audit can lead you astray, and these are addressed in detail in our whitepaper Eight Ways in Which a Poor Quality Energy Audit Can Prove Costly to the Building Owner. has experience. Be sure to look at resumes, and descriptions of past projects. For more information on picking the right energy auditor, see our whitepaper How to Avoid Energy Audit Disasters. Remember, bad advice is worse than no advice. 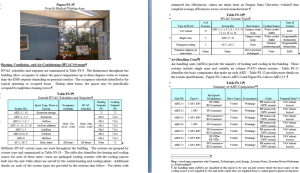 What is the Difference between and ASHRAE Level 1, Level 2 and Level 3 Energy Audit? I have talked to many who claimed that they conduct energy audits–they may have thought they did, but they did not conduct energy audits. An energy audit by an electrical contractor will not likely cover all energy consuming equipment. For example, it is likely that they will miss anything building envelope or boiler related, as they will focus only on those items that might generate revenue for their company: namely transformers and lights. These limited scope type of audits only serve to help the contractor, and are a disservice to both the customer and the industry, as the concept “energy audit” loses value in the eyes of the customer. Because there was so much variance in the industry as to what exactly composed an energy audit, ASHRAE kindly stepped in and defined varying degrees of energy audit rigor. These different levels of audits are now called ASHRAE Level 1, ASHRAE Level 2 and ASHRAE Level 3 audits. Some buildings don’t require hundreds of hours of engineering time, and a smaller audit will suffice, whereas for other buildings, the additional time and analysis is well worth the investment. A rightly sized energy audit will provide the right balance between energy audit cost and value of the audit. 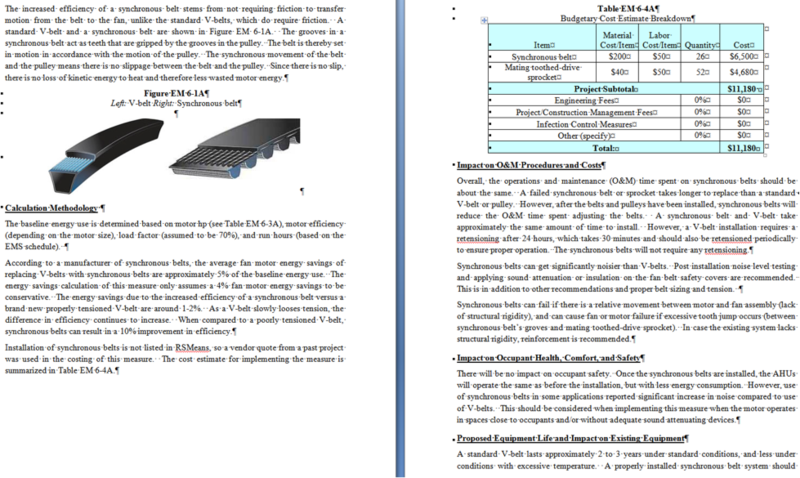 The ASHRAE Level audits are recommendations. They are not law. You can always pick and choose what they want and don’t want in the audit. What is most important is that you get value for your money. If you spend $10,000 on an ASHRAE Level 2 audit that finds energy savings potential of $5000, then you overpaid for the audit, and probably should have gotten an ASHRAE Level 1 audit. The ASHRAE Level 1 audit is a walk-through audit that will identify energy efficiency measures (EEMs) while limiting the necessary engineering time and costs to produce the report. 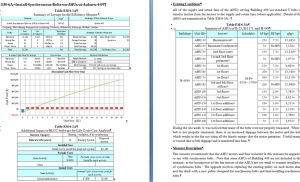 The estimated savings and costs associated with each measure are of rough order magnitude. The brief report focuses on low-cost and no-cost measures, although capital measures are identified when found. The report also includes a summary of utility data, the estimation of savings associated with a rate change, the calculation of the energy use index, benchmarking, and targeting. A small building will use very little energy, and will likely contain very little energy savings potential. For these small buildings, an ASHRAE Level 1 audit should suffice. Conducting more advanced audits on these small buildings may not be the most feasible option. We often perform ASHRAE Level 1 audits for clients who are seeking LEED-EB status. ASHRAE Level 1 audits are required as a prerequisite to attain LEED-EB status. The ASHRAE Level 2 audit is more detailed and requires proficiency and thought to create a quality audit report. The Level 2 audit includes a complete description of the facility, including an equipment inventory, an energy balance, detailed energy savings and costs associated with each low-cost and not-cost measure, financial analysis of each recommended measure, identification and rough estimates of capital project costs and savings, and a recommended measurement and verification plan for each recommended measure. The Level 2 audit is the most likely type of energy audit for larger buildings. The Level 2 audit balances the need for engineering rigor with the need to keep energy audit cost effective. The additional accuracy afforded by the Level 3 audit may not be worth the additional cost. We often perform ASHRAE Level 2 audits for clients who are seeking LEED-EB status. ASHRAE Level 2 audits are worth 2 points (LEED-EB Credit 2.1, Option B) and are sometimes selected by our clients as it is less expensive than Retro-Commissioning (LEED-EB Credit 2.1, Option A). ASHRAE Level 3 audits are designed to provide additional engineering rigor for more expensive capital projects where risk is less tolerated. In these audits, trend logs and data loggers are used to better understand how the buildings react to changes in ambient conditions and occupancy. 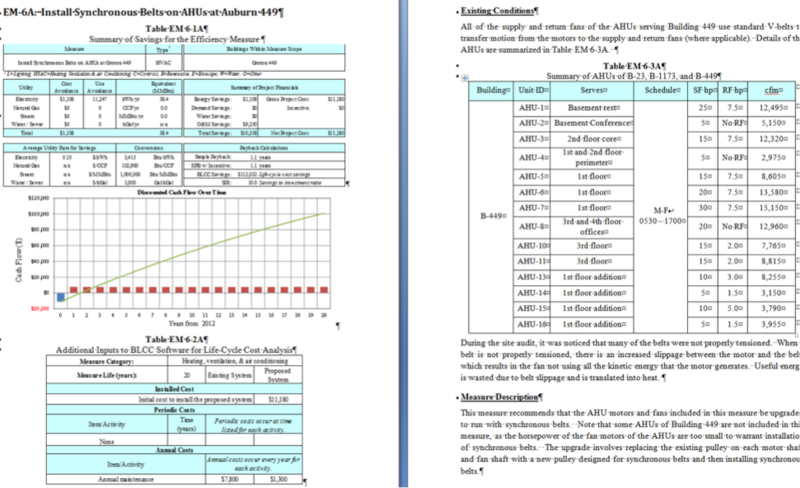 Calculations for HVAC measures are done with hourly simulations. Detailed costing estimates are provided, as are life cycle cost assessments. Typically a scope of work and schematics are provided with the audit so that the contractors installing the measures understand exactly what is to be installed. The reports contain more detailed descriptions of the measures. Level 3 audits are sometimes called Investment Grade Audits (or IGAs). These audits are typically done as part of a performance contract. 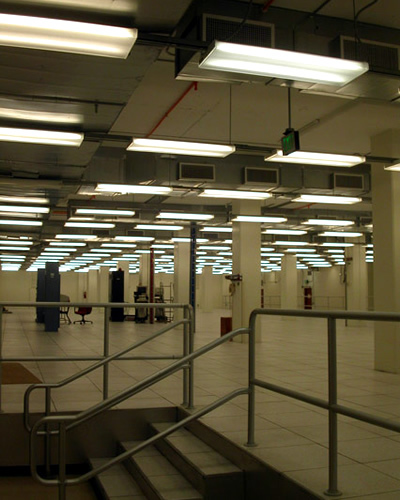 In the 1980s and 1990s, DDC energy management systems (EMS) were being installed in large buildings throughout the country with claims that they would reduce energy usage. That turned out to be a false claim. An EMS saves energy no better than a hammer builds a house. The EMS is a tool that can be used for good or ill, just as a hammer can be used to build or destroy. With an EMS, an unsophisticated building operator, through use of overrides and poorly chosen setpoints, can waste much more energy than he would have in the past. For most building operators, the main focus of day-to-day activities is to avoid hot and cold calls. Energy efficiency falls far down the list of concerns. Often this emphasis on avoiding complaints leads to overrides of control settings which may waste significant amounts of energy. There are other causes that lead to EMS systems not saving energy. Many EMS installers don’t understand energy conservation either. They understand how to install EMS systems, and make them work. However, due to ignorance, poor contract scope, not enough hours budgeted to the job, or value engineering, many energy efficiency strategies are just not programmed into the EMS, which might otherwise have reduced energy usage. In the 2000s and 2010s Retro-commissioning (RCx) has come along as a popular means to reduce energy usage. Now, all the energy that was supposed to be saved when the EMS was installed, can now be saved because RCx can optimize the EMS, implement missing energy efficient strategies, and reduce energy waste. According to some authoritative sources, RCx is supposed to get the building back working as it had been originally designed. However, as many in the energy efficiency business know, the original design is often not energy efficient, as it is often the work of architects, whose main focus and area of expertise has not been energy efficiency. A better definition of RCx is to take the building and its controls as they currently are, and to optimize the controls to make the building as energy efficient as is economically feasible, while still maintaining occupant comfort. This optimization is usually done through a combination of repairing control devices (such as economizer dampers), replacing broken components (such as leaky valves, broken VFDs, or faulty sensors), and reprogramming control sequences so that they reduce energy usage. Whereas energy audits often focus on replacing inefficient equipment with more efficient equipment, RCx focuses on optimizing the control of this equipment. 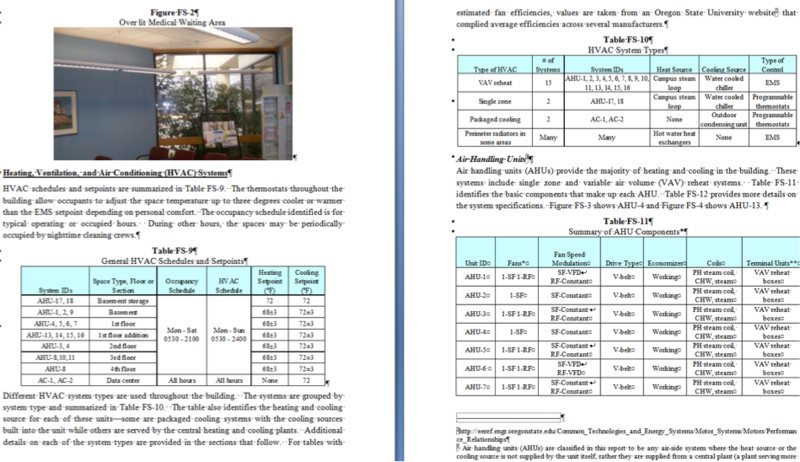 RCx studies are more detailed than energy audits. While an energy audit typically involves one visit to a facility, and recommendations are made based on one view of a moving target, RCx employs functional testing, trend logging, and/or data logging to get a better, more in depth, understanding of how the hvac equipment responds to varying conditions. A good RCx study will capture an understanding of how the building operates during the entire year. An RCx study will identify inefficiencies that cannot be found during an energy audit, and RCx will determine the root cause of the problem, so that specific recommendations can be made. Finally, once the recommendations have been made, and the measures have been implemented, RCx often includes a measurement and verification phase, to quantify the savings the measures are actually providing. RCx is expensive relative to audits, however, the results are usually quite favorable. The building owner can spend the thousands on new equipment, which may or may not work as advertised, or commission an RCx study which not only provides a good return on investment, but also measures and verifies that the savings have actually occurred. What is the Difference Between Energy Audits and Retro-Commissioning? An ASHRAE Level 1 or Level 2 energy audit is like a snap shot of a building, whereas retro-commissioning (RCx) is more like a video of the building. If you have an energy audit performed in the summer, the auditor should be able to identify air conditioning problems, but may not be able to identify heating problems, as the heating equipment may not have been running in the summer. RCx is more focused on how the equipment operates and how the equipment responds to changes in ambient conditions or occupancy. Trend logs and/or data loggers are used to record temperatures, pressures, power, etc. hourly or in 15 minute intervals. This data is then analyzed to identify problems in how the equipment is working. RCx also typically involves functional testing, which is a systematic way of testing how the equipment responds to changes in ambient temperature, occupancy or schedule. Functional testing might answer questions like: what temperature chilled water is being provided when the outside air temperature is 30°F, 40°F, etc. The inputs to the controls are overridden or simulated in order to document the system’s response. An energy audit focuses on measures that if implemented, will save energy. Many of these measures involve purchasing and installing new capital equipment, such as new chillers, pumps or boilers. RCx focuses on how the existing equipment is controlled. RCx measures are mostly repairing, recalibrating and reprogramming controls and control devices such as temperature sensors and damper actuators. RCx measures are typically inexpensive to implement and typically offer simple paybacks of two years or less. An RCx study is typically more expensive than an energy audit, however, when you combine the cost of the RCx study with the cost to implement the measures identified in the report, you will find that RCx is typically less expensive than energy audits, as energy audit measures often have longer paybacks. Our senior engineers have been conducting energy audits for over 15 years and have P.E.s and/or CEMs. Abraxas has conducted hundreds of energy audits and retro-commissioning studies. John Avina, CEM, CMVP, President of Abraxas Energy Consulting, has worked in energy analysis and utility bill tracking for over 17 years. During his tenure at Thermal Energy Applications Research Center, Johnson Controls, SRC Systems, Silicon Energy and Abraxas Energy Consulting, Mr. Avina has managed the M&V for a large performance contractor, managed software development for energy analysis applications, created energy analysis software that is used by several hundred energy professionals, taught over 250 energy management classes, created hundreds of building models and utility bill tracking databases, modeled hundreds of utility rates, and performed and managed energy audits of over 15 million square feet of building stock. Mr. Avina has a MS in Mechanical Engineering from the University of Wisconsin-Madison. In 2010 and in 2013, the Association of Energy Engineers recognized Mr. Avina’s work with the Energy Professional Development award for Region 5. 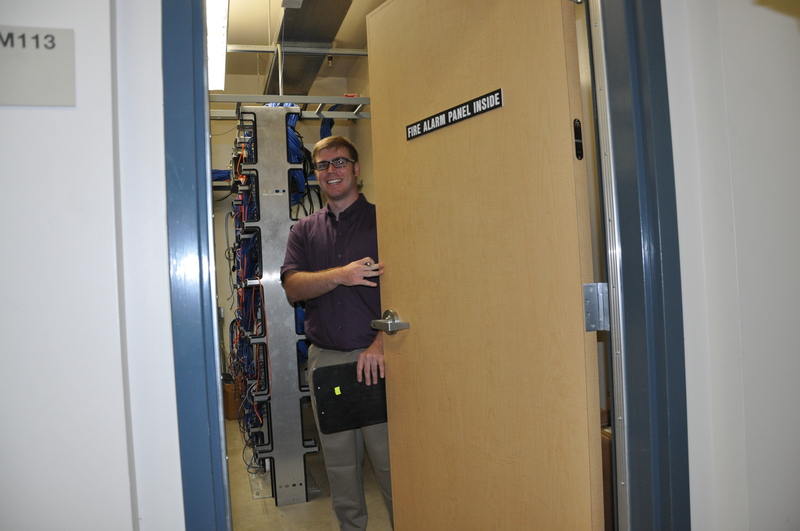 John Avina- Hands On Energy Engineer Performing an ASHRAE Level 3 Audit. Ertun Reshat, CEM has more than 17 years of energy engineering experience. Prior to joining Abraxas Energy Consulting, he worked over 3 years with AECOM and over 4 years with Johnson Controls. With extensive training and experience in the energy auditing and project development, Mr. Reshat served as a senior engineer for AECOM providing IGAs and Level II audits and developing projects for California State University-Chico, California State University-San Marcos, and many more. For these two projects, he lead the audit and savings calculation efforts for all HVAC and water systems measures. Overall, he has successfully completed more than 150 commercial and industrial combine energy audits throughout his career. At Onsite Energy, he specialized in providing measurement and verification of energy savings He is proficient in data collection and real time monitoring systems for low and high voltage equipment. Having seen projects go through the entire process, he brings with him a practical knowledge of what works and what does not work, and an understanding of problems that can be avoided. Robert Urban, CEM, CxA, is the Senior Project Manager at Abraxas Energy Consulting, has been responsible for managing a team of energy analysts and engineers, the development of detailed process manuals and quality control tools, the establishment and performance of dozens of utility bill tracking databases, and the set up and maintenance M&V projects for a handful of 500 to 1000 unit big box store chains. Mr. Urban was responsible for managing the production and delivery of 39 federal energy audit documents in a 3 month period. Other significant contributions include directing the development of energy management software for both residential and commercial applications. Steve Rottmayer, P.E. has been working in the energy efficiency field for over 15 years and has led energy assessments in over a hundred buildings, including scoping-level walk-through assessments, detailed energy studies and retro-commissioning analyses. Many of his energy-efficiency projects included start-to-finish implementation that culminated with measurement and verification of the achieved energy savings. He specializes in energy audits, retro-commissioning, design-build scope of work development, design review, construction assistance, field data collection and measurement and verification. He conducted energy assessments for a variety of customers including the SFPUC, PG&E and Alliant Energy. When it comes to performing commercial energy audits, we know what we’re doing.